Aaron Koblin's New York Flight Traces captures the flight path of every plane that arrived or departed Newark, LaGuardia or JFK on August 13, 2008. 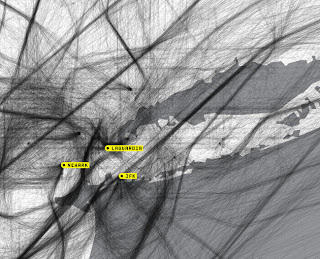 Wired published this to illustrate an article on the flow of aircraft in and out of New York City. To help reorganize this airspace, the FAA called on Mitre, a Beltway R&D firm that works exclusively for the government. Mitre's scientists and mathematicians, in cooperation with some of the region's air traffic controllers, are completely rethinking the flow of aircraft in and out of New York City. Current flight patterns evolved like a rabbit warren, with additions tacked on to an existing architecture. As airports grew busier and airplanes started flying higher and faster, that architecture became increasingly inefficient. The plan, the unfortunately named New York/New Jersey/Philadelphia Metropolitan Area Airspace Redesign, aims to bring order to the air. Think of it as a redrawn map of the roadways in the sky. While planes used to chug in and out of the city on a few packed roads, the redesign spreads out the aircraft by adding new arrival posts (exit ramps), departure gates (on-ramps), and takeoff headings (streets leading up to the intercity highways). But the biggest move will be making the space for all these additions. Mitre's proposal is to extend the boundaries of this airborne city into a 31,180-square-mile area that stretches from Philadelphia to Albany to Montauk.